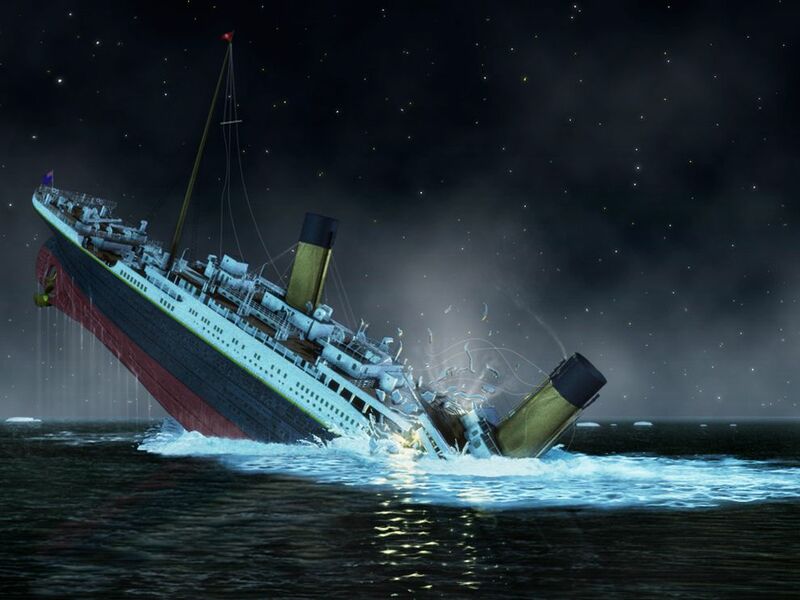 On April 15, 1912, the RMS Titanic sunk in the North Atlantic Ocean. The bow of the Titanic plunges into the North Atlantic Ocean. On April 15, 1912, the RMS Titanic sunk in the North Atlantic Ocean. The largest and most luxurious ship in the world, the Titanic was also one of the most technologically advanced. The ship had several watertight compartments designed to keep it afloat if damaged. This led to the belief that the ship was unsinkable. However, only four days into its maiden voyage, the Titanic struck an iceberg near Newfoundland, Canada. The collision damaged the ship and its watertight compartments. With a limited number of lifeboats, many passengers could not escape the ship. Only hours after the collision, the Titanic sunk, taking about 1,500 passengers with her. The fate of the Titanic led to new international agreements to prevent future disasters, such as the creation of an International Ice Patrol that would alert ships of icebergs. In addition, the first International Convention of Safety of Life at Sea created new lifeboat regulations to protect the safety of passengers.